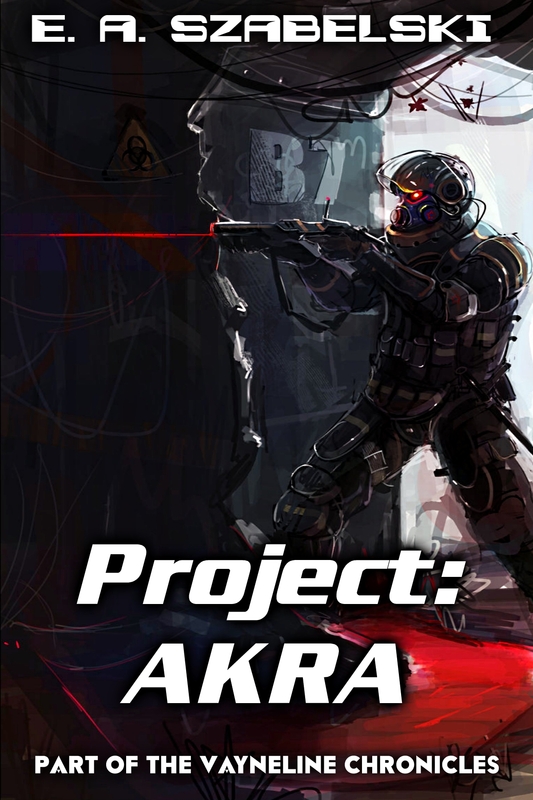 Project: AKRA is a story that follows an elite military group that is sent into a very hostile planet to recover the unknown AKRA that others will kill for. One of the best Solarian special ops teams lead by Raist is recruited for this mission into a planet that the anti-air is too severe for a conventional attack and they are forced to land and traverse a planet that presents a harder challenge than most modern armies. The dangers range from flora that its edges will cut through even advanced suits, to a sort of razor/acidic underbrush grass that will cleave and dissolve a human’s arm as they watch. From the beginning the mission goes bad with their orbital insertion is disrupted and the team is separated. Fighting their way together, the realize they have one shot to recover AKRA. When AKRA is found, and the secret behind it makes sense why groups would kill for it. What follows in one of the most intense battles the group has ever faced, and the sacrifices they must endure to live up to their reputation as a group that has never lost. What AKRA means though goes beyond even their elite group, and the value of its information explains why such a valued group as theirs was required for the operation. Raist’s squad originally was a purely scouting/recon group but had preformed so admirably in the field while suffering nearly zero losses they quickly moved up into more and more secretive missions. Oringinally the group was four members: himself as the Leader, a Scout, Agarest the Sniper, and Leio the Support, the Classes represented his original mission type as he lacked Assault Classes among others. The original squad’s Scout died in an ambush and this was the only loss Raist has had which made him stand out among Leaders for having such a long living crew with no other losses or maims. Agrest and Leio were both from the beginning of the groups formation back as a recon group. Agrest was straight out of training, whereas Leio had been deployed with larger groups for a while. Philira came in a few years later as the replacement Scout and Ziko as the Assault when the group was upgraded to more direct action. They have not had a loss nor any casualties which had made the group infamous and garnered them a name for being unstoppable. Raist is infamous among many Leaders given a recklessness of keeping his squad alive despite the recommendation of the ‘replacement cost’ of a Leader compared to other Classes. His sacrificial nature for the others in his group has generated a fanatical devotion to him as they are well aware in other circumstances they might not be so lucky. A large part of this is driven by his own internal pain for the loss of his original Scout which his friend and training partner. Raist has a cocky air, but mentally is very conflicted and calculated. Project: AKRA is currently available on Amazon here. Raist is a Leader Class soldier of a elite team, he is contacted by a cloaked figure requesting him to save ‘AKRA’. There are little clues given, but he is allowed an advanced weapon and a large sum of resources for the task, the figure leaves saying a friend sends regards. He finds a pink hair after talking and suspects it was a human girl. Later, Raist goes to his team while they are traveling to the planet. They are getting decontaminated to not kill the entire planet ecosystem where we are introduced to the other characters. His girlfriend Leio is a Support that helps him with logistics and is attractive which the other two males play on. Agrest is a calm but flirty Sniper who has been with Raist for a long time, he flirts with the young girl Philira. Ziko is a huge, muscular Assault that is protective of the young girl and is tremendously skilled in combat. Philira is a highly competent Scout, but is very naive in matters of love and relationships. As they are getting weapons together, Raist makes a subtle joke to Philira where he says he will show he a trick later, and she is earnestly wanting to see it. He says after the mission if they survive, and she replies she will survive no matter what. The jump out of their ship in space and plummet to the planet, due to a disturbance they crash. Raist is knocked out and recalls his first Scout he lost – A young girl named Laiun who he talked about esoteric things to. Philira finds him and together they fight their way across the hostile planet. They find the other group that was wounded as well, Ziko lost his arm, and Leio’s leg was broken which they fix and Ziko carries her. Fighitng against the animals of the night and the razor bladed trees and grass they come to a rocky fort that Ziko and Leio stay at. Raist wants to rush the base, and leaves them to secure their escape. Philira sets up a descent, river cross, and ascent up the cliff. Raist notes how easy this is for her, whereas he is almost knocked out simply being drug through the rapids she navigated. On the other side they encounter more enemies, but this time of their target. They note how there are multiple races involved which is strange given a hatred for each other. Agrest stays on the outside of the base while the remaining two blitz inside amidst a hail of bullets. They are ambushed inside where they are hit. Philira first takes a hit to her leg, later Raist gets his hand burned off as well as Philira’s upper arm is burnt off. Raist feels a pull of intuition and goes into a regular looking door and sees a Star Priestess. Freeing her, he finds out she is AKRA, but her real name is Ryluna. They run out, seeing Agrest’s hiding spot in flames they suspect he died defending them. Raist uses one of the few remaining shots of the powerful SSAW weapon to help them escape. As they escape Philira is rammed by a huge horned animal. She kills it but is pinned to a tree. Raist desperately tries to free her, cutting into the huge mass but eventually drops his knife. There is a sad moment in Raist admitting he really liked Philira (with implications of seeing Laiun in her) and we see emotion out of the otherwise cold Scout. She gives him her custom pink knife with a yellow star design and tells him to keep escaping and she will buy him time. Much like how his other Scout died buying him time. Reluctantly he leaves her, dragging Ryluna with him. They follow Philira’s previous path down the cliff, river and up the other side. During the slow parts Raist thinks about his past and Ryluna talks to him about her secret: The Emotion Field. Intense emotions imprint themselves on reality, and can be sensed by other people with sufficient sensitivity. The fact reality holds this construct is the largest value of her knowledge, suggesting dimensions not yet understood. On the other side, he find that Leio is killed but no battle seems to have taken place. Ziko starts taunting Raist about how Leaders are worthless, and it is revealed he was an agent for the same organization that took AKRA/Ryluna. The implications are that he helped sabotage thier landing when they all crashed, as well as he killed Leio soon after the others left. Ziko largely outmatches Raist. Raist only wins due to some training with the rough Laiun of his past as well as Philira’s hidden knife that he pulls out of the weapon Ziko is waving in front of his face. Leaving him dying, the wounded Raist staggers through the forest. Eventually he stumbles into the ship, the only one left out of his elite team. The next scene is Ryluna and Laiun talking. Ryluna says how brave Raist was, to which Laiun reveals she was his Scout and actually lived during that old battle. She developed Psionics and was picked up into the Star Priestesses. She could not tell Raist due to secrecy, but had pulled strings trying to keep him alive. Both of the women express admiration for him, but realize he is a pained soul, aware of things most people are not. It is revealed that the figure at the beginning of the story is actually Laiun. The final scene is a melencholic Raist, rolling Philira’s knife in his hands. He thinks about things like Agrest’s love letter he promised to give to a girl as well as what happened down there. It ends with him repeating his favorite line of ‘naturally’ after ordering a new team composed entirely of pink haired Scouts.